Oklahoma was hit with an earthquake yesterday, its second 5.0+ quake this year. The increased number of earthquakes have been linked to the use of hydraulic fracturing, or fracking—specifically the underground disposal wells where the run off from fracking is stored. 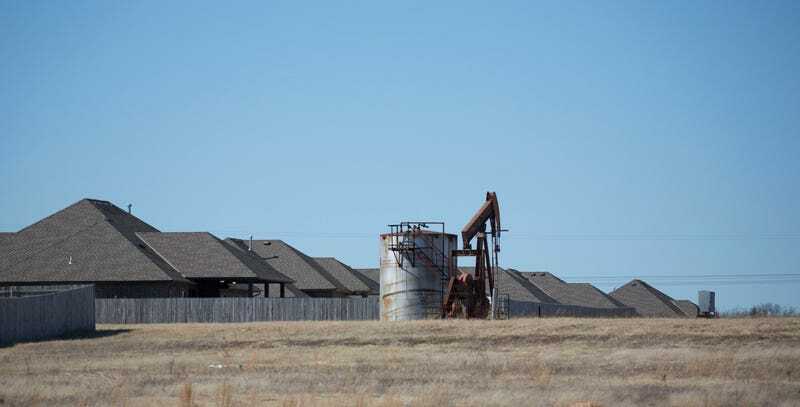 The Oklahoma Corporation Commission has taken note of the relationship between the quakes and the wells and has ordered the shutdown of 35 disposal wells. “This is a mandatory directive,” Oklahoma governor Mary Fallin told CNN. In February, after a large earthquake shook the state in January, the Oklahoma Corporation Commission cut back on the planned number of wells produced via fracking. Clearly that did not seem to do the trick, which is why Fallin and company are instituting this new shut down. Fracking is inextricably linked to Oklahoma, which was the site of the first test of fracking back in 1968. But in the last twenty years fracking has become increasingly common. In 1998 a new fracking technique was developed in North Texas that allowed companies to extract natural gas from shale very cheaply. Since then use of the technique, which shoots water and chemicals into the shale to forcibly move natural gas up and out into containers above ground, has exploded. From Canada to Texas it is the preferred method of natural gas extraction. But shooting all that water into the shale makes normally very stable rocks very slippery. And slippery rocks means a lot of movement. That’s where Oklahoma’s recent rash of earthquakes are coming from.